This section discusses primarily billboards, but all the material could apply to other signs such as on bus benches and other common transit signs. They can be an excellent method of spreading the NA message to many members of society. Basically, this is a large print public service announcement (PSA) or posting effort. While you may wish to place the PSA on a billboard, you may also wish to consider selecting a site for a painted sign. This can allow for a longer term PSA. Some agencies that own billboards set aside a portion of advertising space for public service announcements. The fee for these community announcements is often low or non-existent. If the agency offers to waive the fee, you may wish to discuss the Seventh Tradition with them. First, you must determine who these agencies are. Often the billboards have the media company’s name at the bottom. Empty billboards often display the company’s name and phone number. In addition, local telephone directory classified ads will list them. Contact one agency to begin with and ask to come in and talk to someone about community announcements or PSAs. Be ready to educate your local Fellowship about “personal anonymity vs. program anonymity” and the difference between promotion and attraction. Select text for the billboard or painted sign that does not make or imply any promises. What costs are involved in renting space for our PSAs? What additional costs are involved to prepare the PSA for placement? Can you help us with the graphics or direct us to a low-cost firm who can? How many spaces will we get? How long will they stay up? Maintaining a good relationship with the ad agency is very important for a positive, ongoing effort in this area. However, be wary of requests by the agency that might compromise our Traditions. 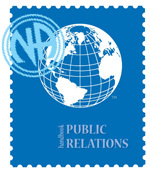 Often, the ad agency may wish to partner with NA to show that they are doing good things in the community. This can involve a degree of affiliation or implied endorsement that violates our Traditions. Be gentle in explaining this to the agency; they often don’t understand why, if they are doing a good thing, we shouldn’t let their name be used with ours. Your subcommittee may decide to find a site and paint a sign on your own. The first step in this case will obviously be to select a site. Be sure to check with local authorities to see if permits may be required. Keep in mind our need not to involve NA in controversy or any type of outside endorsement. The site, whether it is a wall or an empty lot, should not contain any other signs for services or products that are too close to our PSA. In making arrangements for the sign, be very careful to be clear with the property owner about your intentions. A written agreement is a good way to ensure that both parties understand the arrangement and who is responsible for what. This can avoid many problems later when trusted servants rotate to new positions. Be especially sure that the property owner understands what NA is and exactly what the sign will say. It is important that you show the property owner the design of the sign. Negotiate a rental price so that your subcommittee carries the message of recovery in a self-supporting manner. Carefully consider all the necessary costs. Be sure that the work to paint the sign is well done, as the sign will reflect upon how people think of NA. Set aside the funds to produce the sign and make a plan to complete the project. You might consider a light to illuminate the sign at night. The cost of electricity can be factored into the monthly rent. Keep it simple, and don’t make promises beyond our mission! 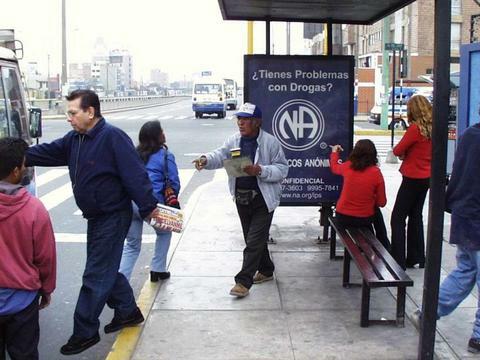 Billboards, bus benches and transit signs should always include the full name, Narcotic Anonymous. Phoneline number may or may not be used, according to area/regional needs. Make sure to use the full phone number on your sign including area code or city code. The message should be simple and easy to comprehend. The billboard, bus bench or transit sign should not be cluttered with extraneous material. Care should be exercised in the layout and art work done for this project. Project groups should consider using contrasting colors and limiting their layouts to two types of print.